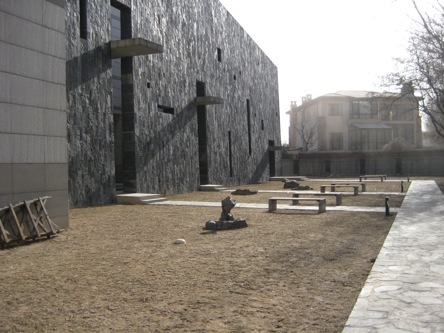 Unlike Beijing Haidian Church, this is a brand new church to meet the growing Christian population in Beijing’s commercial district – not one to replace an old place of worship. The architectural design is similarly modern and simple. The designer pays great attention to the symbol of the cross. It is everywhere. 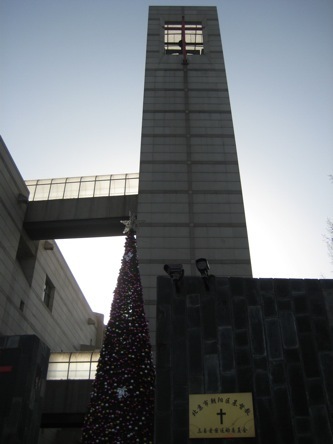 This red cross stands in the yard adjacent to the main building. 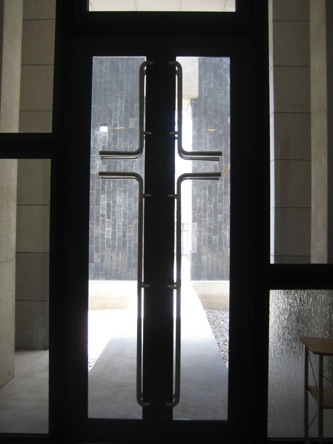 The door handle shapes like a cross. 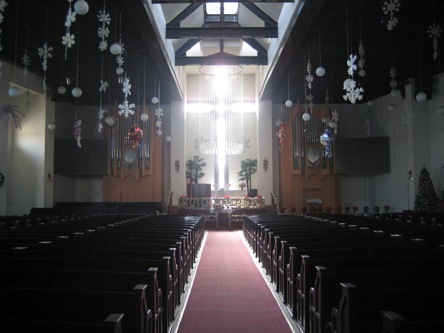 The main chapel features a large cross behind the altar, formed by natural light. 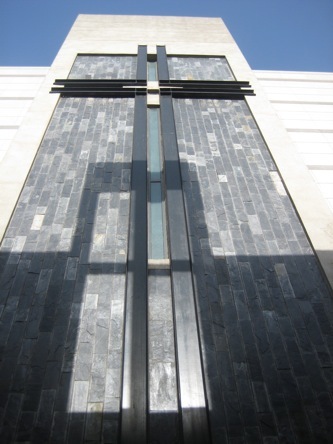 From the back, you can see the cross made of glass to allow the light to come through. There are some bulletin boards inside the church. 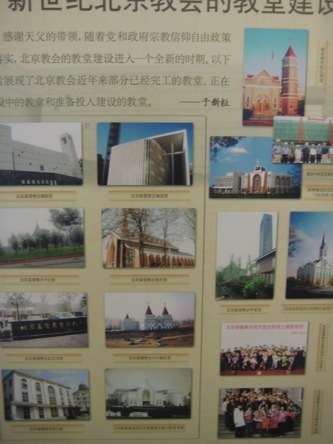 This one shows the many newly constructed churches in Beijing. 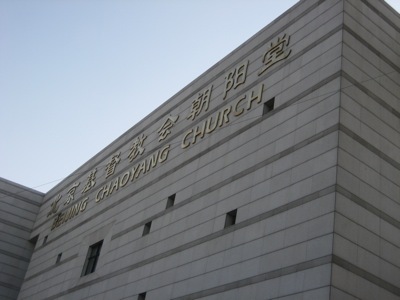 Both Beijing Chaoyang Church and Beijing Haidian Christian Church belong to China’s official Three-Self Patriotic Movement of the Protestant Churches. Three-self means self-governance, self-support, and self-propagation. These principles were first made during the last decade of 1890s to help guide the creation of an independent Chinese church from foreign powers. They were targeted to the fact that much of China’s churches then were governed, supported and expanded by foreign missionaries and churches. Probably not. 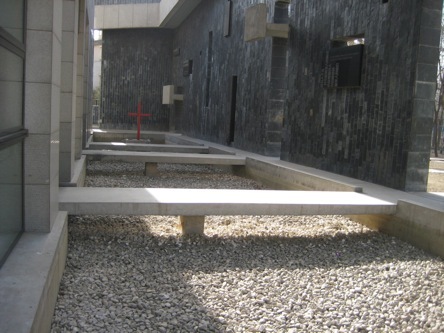 Although in official language, direct financial support of the government to churches is not mentioned, it is obvious China’s many new glistening churches are the result of government funding. It is almost impossible that China’s low-income Christians can come up with hundreds of millions to hire German architects to build these grand new churches. Imagine if someone give you $1 million dollars to build you a palace home, what would you do to that generous person? On the bulletin board, some familiar faces. 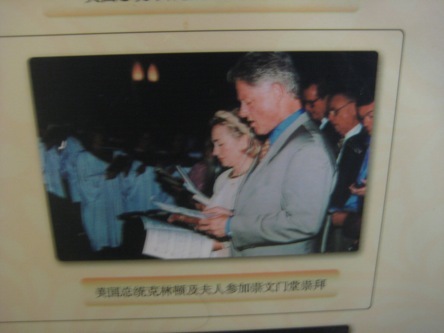 The Clintons were at Chongwenmen Church. 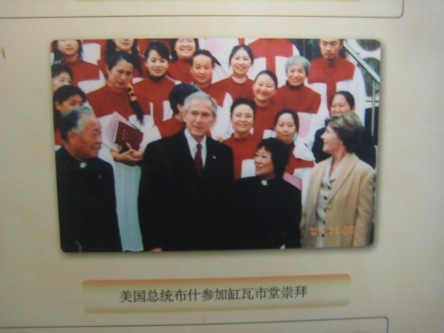 The Bush couple were at Gangwashi church. I found this interesting video of a grand-daughter shooting a video of her grandma attending Sunday service.